IT would make the perfect mountain escape for a privacy-obsessed film or pop star. But, in truth, it would be best for a lover of real stars… the ones in the sky! For the Mallorca observatory, which has just come on the market, is celebrated around the world for its track record of discovering comets. Astronomers at the Observatorio Astronómico de Mallorca, in Costitx, have spotted no less than seven comets during its 26-year history. These include DA14 which, had it struck earth, would have created a 100-foot-high tsunami. On sale for €1.8 million, agent Amanda Butler at MJC Associates hopes the unique local landmark will be bought by an astronomer and kept open to the public. She claims that a group of developers are currently looking to buy it and plan to make it into a private estate. “It is in the interests of everyone to keep it open,” insisted Butler. “It’s a wonderful facility and it would be a great shame to lose it. She believes the right sort of buyer would get help from the town hall to use it in part as an eco-lodge or hostal. “This would make it more commercially viable and would end up attracting international study groups from far and wide, as well as schools and universities from the mainland, an interesting addition to our tourism industry,” she continued. 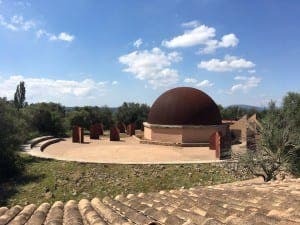 Mallorca’s space-age planetarium was added in 2003, and, together with its sister La Sagra planetarium in Granada, discovered an astonishing 7,000 asteroids, second behind only the USA. The combined asteroid discoveries made in the rest of the world during the same are only half those made by the two Spanish centres. The most important discovery was in 2012 with DA 14, which would have had a ‘blast radius’ of 2,000 square kms. “If it had landed on Mallorca it would have destroyed the island with the force of an atomic bomb,” observatory guide Joan Guillem told the Olive Press.